Mark Thibodeaux, plant manager for ReEnergy Holdings, outside the biomass plant in Stratton. Central Maine Power’s proposal to run a high-voltage transmission line 141 miles from western Maine to Lewiston has become a flash point in the region. Big issues are in play, from global climate change to New England’s energy landscape and outdoors economy. Big money is also at stake. CMP says if the billion-dollar project is approved, Mainers will benefit from lower electricity bills, new jobs and a buffet of incentives. But some would suffer financial losses. On the back lot of a biomass energy plant in Stratton, a bulldozer as big as the local post office pushes around freight loads of wood pulp and wood chips, piled as much as 30 feet high. 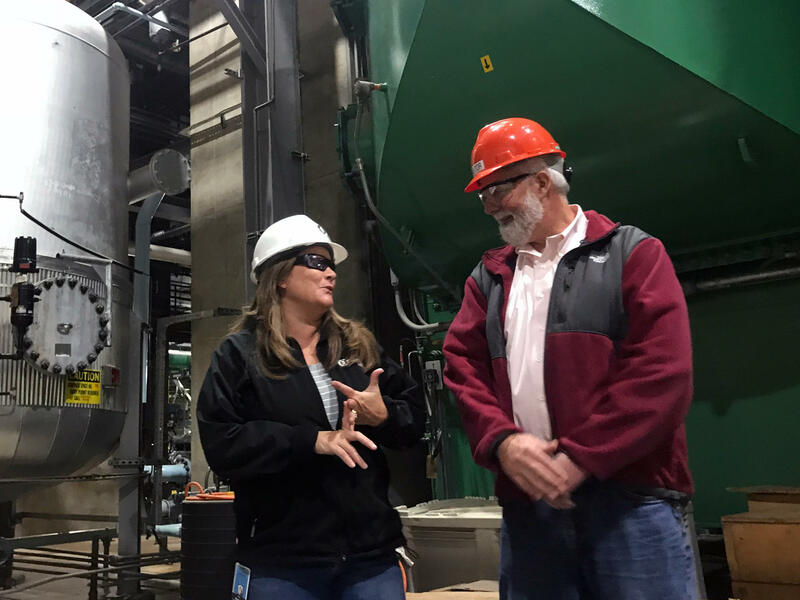 Mark Thibodeau, plant manager for ReEnergy Holdings, says on supercold days, New England’s demand for electricity is high, and the plant burns enough wood to make the electricity for some 40,000 homes. As few as three people can operate the plant, but it employs 28 full-timers and contracts with some 200 loggers, truckers and other workers in an operations and supply chain that weaves in and around the area’s forests for 50 miles around. It could all be at risk, Thibodeau says, by the CMP project, which would bring hydroelectricity from government-owned dams in Quebec through Maine into the regional power grid. That big slug of energy, enough to serve a million homes in Massachusetts, could crowd out biomass and other local energy sources. Wood chips and wood pulp are piled high at the ReEnergy Holdings biomass plant in Stratton Maine, near the Sugarloaf ski area. The plant burns tons of fuel every day it’s in operation, providing employment for loggers and truckers for miles around, as well as its own 28 full-time workers. ReEnergy and others worry that CMP's project could undercut the price they get for electricity, hurting profits and maybe forcing some to ramp down or close. Because of the way the region’s complex energy markets work, when Massachusetts pays for a major influx of renewable energy, there will be downward pressure on electricity prices in the rest of New England. Some days it could drive prices below what it costs some plants to make electricity. If that happens often enough, it could force some already struggling generators, including Maine’s biomass plants, to ramp down or even close. Calpine spokesman John Flumerfelt (right) and Westbrook plant manager Holly Bragdon. “Artificial price suppression ultimately erodes the market,” says John Flumerfelt, spokesman for Calpine Corp.’s natural-gas-fired power plant in Westbrook, which employs about 30 people and produces enough electricity for half a million homes. He acknowledges that energy generation is a competitive marketplace. The problem, he says, is that Massachusetts and Quebec are tilting the playing field. Some of the state’s largest energy users, though, are focused on the savings they would get thanks to the project’s price-suppression effects. "The grid exists for consumers, not for generators." “The grid exists for consumers, not for generators,” says Tony Buxton, who represents a group of large energy users such as mills and chipmakers. He notes that CMP would provide an additional $140 million in rate subsidies to Maine. Overall, he calculates, the average homeowner would save about $1.50 a month. Some opponents peg the savings at far less than that, but Buxton says for some energy-intensive manufacturers, the savings could be key to stabilizing a wobbly bottom line and saving jobs. “For example, we lost Madison Paper — 200 superb jobs in northern, central Maine — precisely because of the cost of energy and the lack of reliability to our system,” he says. CMP says 1,700 direct jobs would be created over the duration of the construction period. But more compelling for a lot of the communities along the route is the new infrastructure they could tax. CMP says that over time that would be worth about $18 million a year in new revenues. That’s what won the support of officials in Jay, another struggling mill town. “I think in the last six years maybe our tax rate has gone up like 45 percent,” says Shiloh LaFreniere, Jay’s town manager. LaFreniere says the CMP project would bring in almost half a million dollars a year in new revenue, which could lower local property taxes. “If it had been in play this year, it would have been about a $100 reduction on their tax bill,” she says, using an example of a home worth $125,000. Some opponents say CMP has a history of overstating property tax benefits for its projects, a complaint that CMP denies. It’s just one of many disputes over the financial facts that regulators in the state’s Public Utilities Commission are trying to parse as they determine whether, in the end, the project’s benefits to Maine would outweigh its costs.